A few days ago, Paul Penders was honored by the visit of representatives from Ayura Spa, here on Langkawi. Ayura Spa is a part of Berjaya Langkawi Beach & Spa Resort, which again is a part of the Berjaya Corporation Group of Companies. 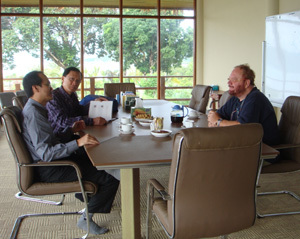 Also joining the meeting were representatives from Green Meadow Corp., Paul Penders’ distributor in Malaysia. Representatives from Ayura Spa were invited by our very active distributor in Malaysia, Green Meadow Corp. in Kuala Lumper, in order to introduce them to Paul Penders’ products. Angelika, who is a Naturopath, has spent more than 15 years on the natural “path”, working all over the world. Paul Penders started out, telling the history of the company, with special emphasis on how it all started back in Holland and his refusal to test on animals. The refusal brought Paul in the public spotlight: newspapers, TV-news, talk shows and radio interviews. The GRAS list is a list of already approved ingredients in USA, which are Generally Recognized As Safe. Thank you for doing your homework, Angelika! As the morning turned into noon, many aspects of spa products were discussed, followed up by a “tour of the house”, including a visit to Dr. Gatot’s laboratory. By then, it was time for lunch before departing; a typical, local Malaysian lunch was served. On behalf of all the Paul Penders staff, I feel safe to say that it was a very pleasant visit from Ayura Spa Langkawi. Last time, Professor Gerard Bodeker – the editor-in-chief – presented the book on video. Today – thanks to the publisher EDM Books – it is possible to read 20 selected pages from the book. All you have to do is to click here and a web-book will open op in a new window. Give it time to load. Navigate back and forth using the arrows in the lower-right corner of the screen, or by double-clicking on the corners of the book. In the process of promoting the book, copies are given away by Paul Penders. Here goes one to Dr. Ghani (MD), who, by the way, is a friend of some of the co-writers. 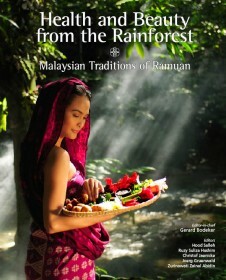 The front-page says “Malaysian Traditions of Ramuan”. Ramuan in Malaysian culture represents a unique melting pot of knowledge and practices derived from Malay, Chinese, Indian and indigenous people’s traditions. Historically, the art of Malaysian healing and beauty is a manifestation of these influences. This traditional knowledge of health and beauty within such a multi-racial community has been practiced and enriched for generations. In the old days, one would go no further than the garden and kitchen to clean the hair and body or even to get cures for common ailments. A whole plant or parts of plants (such as leaves, stems, barks, fruits, roots) and mixtures of plants and plant’s parts are used and consumed. The therapeutic formulations produced from these mixed ingredients are called Ramuan. Another way to express it is that Ramuan reflects the way of diversity within unity – a very Malaysian way. Malaysian Traditions of Ramuan brings together for the first time in one book the collective wisdom of experts and practitioners of Malaysia’s traditional healthcare and beauty systems. The book examines the importance of seeking and maintaining balance – vital for overall wellness, beauty and vigour – and highlights the intertwined nature of medicine and food, cutting through the myth to fact and actuality. It showcases the best of Malaysia’s ancient healing systems – indigenous, Malay, Chinese and Indian – including their practice in Malaysian spas. Don’t forget Paul Penders’ contest “Win a Book”. Click and learn how you can win your own copy of “Health and Beauty from the Rainforest”. There are two copies to be won. We wish to thank Professor Gerard Bodeker for allowing us to bring extracts from the book. On 23 July, we got 2 visitors all the way from Perth, Australia – Mr. Goh and Mr. Lim. They came to our HQ in Langkawi UNESCO Geopark and to discuss how Paul Penders products could be sold again in the market of “Down Under”. Of course, it will not be that easy because Australia has already several wonderful organic cosmetics available. Paul Penders products were once sold in Sydney and Melbourne some 15 years ago and shipped all the way from California. But at that time, there were huge import taxes and the US dollars was on its highest peak. Add to these, the high shipping costs from California made it difficult to compete with local Australian brands, thus we decided to discontinue. Today these huge import taxes are being removed; the exchange rate is more favorable and the products are now freshly shipped from a nearby warehouse. Therefore, the conditions are much better. We look forward to a fresh start! Look for Paul Penders products that will be available in Australia as well soon! A few weeks ago, Paul Penders came back from a business trip to Singapore. Big was our surprise, when he immediately started talking very enthusiastically about… the Malaysian rainforest! Last time we checked on the map, Singapore and Malaysia were two separate countries! They still are, by the way… And rainforest in Singapore? Well, yes, there is actually a primary rainforest in Singapore. It is the size of 2,000 hectares, and Singapore is the only large city (besides Rio de Janeiro in Brazil), that still boast primary rainforest (read more here). But that was not where Paul had been. So why all this talk about rainforest? As in most cases, there is a natural explanation, and so was the case here. It turned out, that Paul had visited a book store on his way to Singapore, and had picked up a copy of Professor Gerard Bodeker’s brand new book “Health and Beauty from the Rainforest”. Now, after having read the book, I agree completely. This book has to – and really deserves – be mentioned on the blog. What better way to start, that having the author himself presenting the book and telling about it? Either watch the video, or read the extract of what Professor Gerard Bodeker said during the presentation of the book at Expo West 2009 in Los Angeles on the 29th of April. The extract of the speech is below the video. Professor Gerard Bodeker (Oxford University, UK & Columbia University, USA) first told that he has been connected to Malaysia for 10 years. His first visit to Malaysia was due to an invitation from the then health minister, who asked him to help advice on policy development for the herbal sector. Professor Gerard Bodeker finishes his speech by telling the story of how Malay Rajas – in ancient times – when visiting the Emperor of China, instead of gold or silver, brought herbs (like pegaga) as presents. The herbs were considered as valuable as these golden metals. Interested in knowing more about “Health and Beauty in the Rainforest”? Come back to the blog later this week – there is much more to come. And do not forget our competition where you can win your own copy of “Health and Beauty in the Rainforest”. A hugely illustrated book, by the way. Paul Penders’ blog is inviting all – connected to the Paul Penders Organization or not – to participate in our new competition. Two winners will each receive a copy of the brand new book “Health and Beauty from the Rainforest” by Professor Gerard Bodeker. 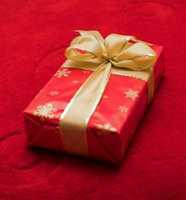 To take part in the contest, all you have to do is to write something to this blog, or about this blog. Write a small entry to this blog (250 – 500 words). Choose your own subject and write about something you find interesting, something that is somehow connected to Paul Penders. Or, maybe it is not…? It could be about protection of animal rights, preserving the environment, or about…? Write, and tell us what YOU think should be on the blog. What do you like about it and what do you not like? And, what should we write about instead? In each of these two categories a winner will be selected and they will each receive a copy of Professor Gerard Boedeker’s new book “Health and Beauty from the Rainforest“. You might not know the book yet, but follow the blog the coming week; we will cover the book extensively. Until then, believe me: It is really a book worth owning. latest Monday, August 31, 2009. The two winners will be chosen by three judges: Paul Penders (CEO), Krista Goon from Redbox Studio (our web-partner), and me (the blog editor). We are very much looking forward to read your emails.